Let's talk toes. And eyes. Funny how the two effect one another. My aging eyes are making it hard to paint my toenails. (Really it's just a logistic problem. If I could get the two closer together, I'd be set.) I've been using this trick for awhile and thought I'd share. 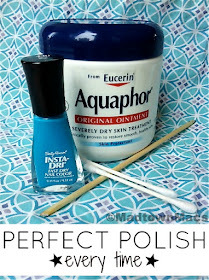 All that's standing between your old eyes and Perfect Polish is a cuticle stick, a Q-Tip, and greasy lotion. Wipe it around your nail, being careful to not get it ON your nail. The polish won't stick to wherever the lotion is. Use the cuticle stick to wipe away the extra. That's all it takes! 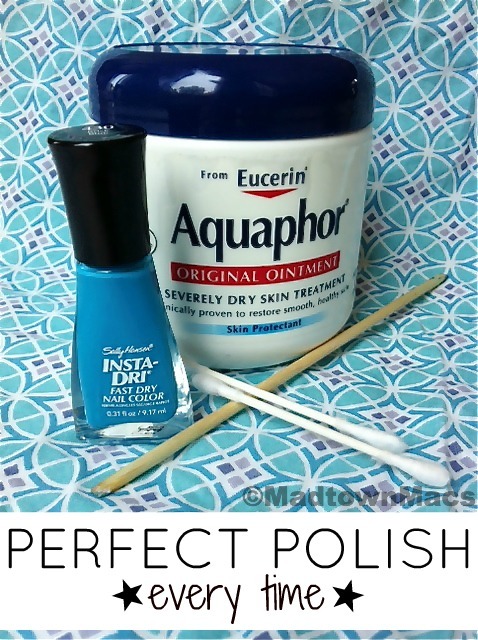 Plus, after your polish is dry rub in the lotion and it helps those dry cuticles! Hope this little trick helps! Great tip! I'm going to have to try this. Thanks for sharing. Found you via Skip to My Lou link party. This is a great tip! It's Christmas in July @ Bear Rabbit Bear Crafts! This week, enter to win a Crafter's Prize Pack! Great idea! I will be trying this out this week (I need to re-paint - lol). Found you at Homemaker on a Dime! What a great tip! I never could get the polish on correctly even before my eyes started aging. Maybe this will help me...Thanks! Thanks for this great tip! I am horrible at painting my nails and get polish everywhere! I'll have to remember this next time! Wow! What a great tip! Thanks! This great! Wouls you mind if I shared it on my Sharing is Caring on Tuesdays post? Can I just say, girl, you shared a great tip! One I definitely will need as my eyes and toe to eye distance ratio increases. Definitely going to give it a try! Thanks everyone! It's great knowing that I'm not the only one with an eye-toe logistic problem. (I mean, I can see my toes down there, I just can't SEE my toes. I'm sure you all understand!) Cheers to perfect summer toes! Just saw this tip on Pinterest. My 40 year old eyes thank you! I bet you I would still mess up! Somehow. :) Good idea, but I am not that steady with the hand. great tip! Can't wait to try it! This works very well! But to make life easier, you can just skip this step. If I get polish on my skin, it comes right off when I shower. You don't even have to rub it or anything- the water takes it right off! I'll usually paint my nails in the evening, then my morning shower takes care of any mistakes. Give it a try! Vaseline works the same way. Haha. I just painting my toes for the 4th and can Sooooo relate. :D I was going to buy one of those mistake sticks but I like your idea so much better. Thanks for sharing this week on BeColorful. This will come in handy when I next paint the nails of two squirmy four-year-olds! Thank you! What a great tip! I usually wait for the polish to dry and scrape it off :) Love the blue toes! I've been using that tip for awhile and it's a really good one! 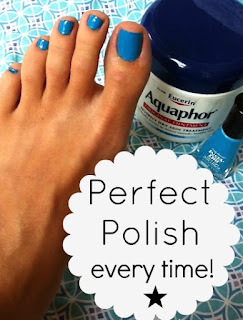 I also find that just slathering on the greasy lotion after painting my toes, then putting on socks overnight, will take off most excess polish on my skin, plus fix those cuticles. That's a really great tip. I hardly ever paint my nails because I'm not good at it. lol But now I know the secret. Thanks! Thanks again everyone! So glad to help out! That is really helpful! And I love your color, too! the only thing I'm confused about is... did you do that before you painted your nail??? because your nail appears painted prior to the lotion. I can see where that would be confusing! Sorry I didn't mention about that! What a clever idea =) Going to try tonight! heeeey! you are a genius!!! LOVE this and will use it today!! I am soooo very messy! Great tip! Btw, this is the week's favorite post :) Thanks for joining Creative Bloggers' Party & Hop. Congratulations!! You are featured this week on Busy Monday at A Pinch of Joy! I hope you will stop by and grab a Featured Button from the Button Box on the sidebar this afternoon. Pinned. Can’t wait to see what else you’ve been working on — hope you will link again soon! Great tip! Thank you ! Wow thank you so much it will help me the rest of my life! Awesome ...I'll be trying this tip next time I redo my nails!! I must try this!! I do something similar when dying my hair. Such a GROSS big toe - could it be any bigger! Could you be any more of a jerk?? Her big toe looks perfectly normal! Where can I find a cuticle stick? You should be able to find cuticle sticks at any drug store (Walgreens, CVS) or Wal-Mart, Target types of stores near the fingernail polishes. I'm going to try that trick! Thanks! Can't wait to try this tip! this is awesome!!! I need to try this tip! You can do the same around your forehead and ears when dying your hair...anywhere the lotion or vaseline is at...the hair dye will wipe right out.. Appreciated your tips, Definitely, I recommend these tips. Thanks. I use a qtip dipped in nail polish remover and do it. Not for my toes, but for my fingers. This is a great idea. I have arthritis and find it difficult to bend my leg to paint my toes so they're far away when I paint them so inevitably I make a lot of mess! Sooooooo .... if one can't see well enough to not get polish on the skin - how can they get the lotion on the toes and not on the toenails? LOL This is why I started getting professional pedicures at 40 (when I started needing glasses). But really you don't have to be exact - just shmear it around the outside and you'll be good! Aquaphor works wonders on diaper rashes. It is a staple in our home! Simple and straightforward method of removing polish, I was amazed by this method. 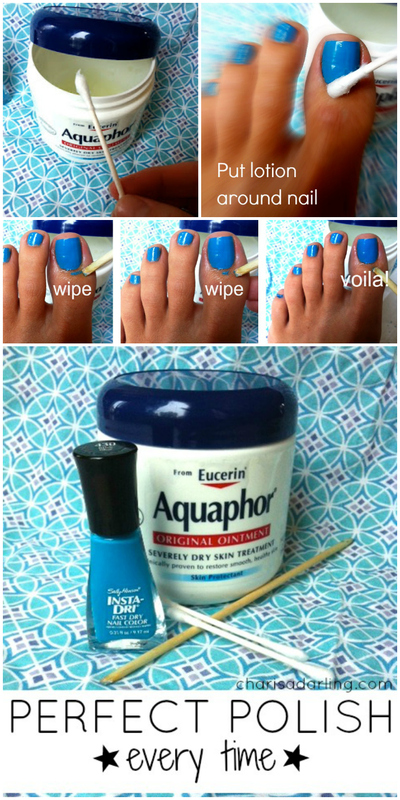 Great handy tips of removing nail polish. This is a wonderful idea and I will try this with my fingernails also. Great idea, I can't wait to try it! I leave my toenails unpolished so many times because I mess them up so badly. Found your blog by acciedent, but I'm so glad I did. I can't believe that someone has the same pet peeve as I do. Sometimes I get so annoyed by carts rolling around the lot, I start grabbing those around me and rolling them into the cart bins? holders? parking spaces?,...whatever they are. I am a native St. Louisan and even though I've lived in Columbia, MO for 35 years, I still call St. Louis HOME. Most of my family is still there and I go monthly if not more. Love that city! This is the one I’m looking for long time. Thanks for sharing this nail polish design tips. Great tip! does this work with any cream, or does it have to be oily? and can I just rub it off when I'm done? Thanks! The lotion needs to be oily. The oil acts as a barrier and what allows the polish to come off your skin.